Glenda Ferris won key environmental victories after the 1981 spill at Equity Mine. Today, she looks to B.C. 's pipelines plan with alarm. Mar. 18, 2012 12:00 p.m.
Glenda and Hap Ferris stand outside a recent open house held by the B.C. Environmental Assessment Office to review the proposed Pacific Trails Pipeline. Glenda Ferris heard it on the radio. “I was in the kitchen, actually baking bread and ironing,” she says. Her sons were at school, and her husband Hap was working in the Northwood mill. It was Nov. 18, 1981. At around 11 a.m., on came the news—a spill at Equity Mine. Ferris has lived on Buck Creek for more than 40 years. She was 26 when she started hauling water from the creek into the remodelled barn where she and Hap decided to raise their two young sons. “We wanted wild,” she says, smiling. Even in busy San Diego, where she and Hap met in a school choir, the two had pioneered a grassroots way to live. Hap & Glenda’s was San Diego’s biggest natural foods store in the 1960s, stocked with organic avocados and other fresh produce that the young couple sourced with help from people like Leonard Richardson. Although her parents had liberal ideas, raising her to reject the widespread racism of 1960s America, Ferris said they were “livid” when she and Hap got active in the civil rights movement, joined street protests against the war in Vietnam, and organized pickets against U.S. Navy pollution in San Diego Bay. By 1970, Ferris said she and Hap were ready to sell their store and focus on raising a family. They looked north, bought some 100 mail-order maps of the B.C. backcountry, and settled on Pemberton or Smithers. But once in Canada, Ferris said they quickly saw what resort towns Pemberton and Whistler would be. And Smithers was all farmland and barbed-wire fences. It wasn’t until a real-estate friend drove she and Hap up the Buck Flats Road that they found what they were looking for—forests, a dirt driveway, and a creek swimming with fish. They settled into the barn, Hap started at Northwood, and in a few years they moved further up Buck Flats into a log home that they built by hand. So it was no small irony to Ferris when Equity Mine started spilling acid just a few kilometres east of her home. “God’s little joke,” she says, shaking her head as she points out the distance on a map. Ferris has seen a lot of maps since that day—maps that show topography, watercourses, forestry roads and mine plans. Days after the Equity spill, she found herself in the Smithers Ministry of Environment office, digging through boxes of maps, charts and mines inspection reports. She soon found that Equity had a bigger than a spill. Exposed to too much air and running water, waste rock at the mine site was creating acid regularly. “Acid rock drainage” was a term that Ferris had to look up and photocopy from a hard-bound encyclopedia. She took it to Terry Roberts, a chemical engineer with the Ministry of Environment. Roberts told her that inspectors had known for months that Equity’s waste rock was a problem, but given how the mine was built, he said it couldn’t be completely sealed off. They would simply have to treat the runoff. Ferris said she didn’t believe it. She and other environmentalists campaigned hard, digging up early inspection reports from BC Research Labs that had raised the acid issue before Equity was built. They faxed materials to the Vancouver Sun and the Globe and Mail, determined they could get the mine rebuilt. In 1982, Ferris helped create a Public Advisory Committee for Equity Mine, which still meets today. In 1985, things turned again after she went to Smithers meeting on an Equity waste handling plan. “There were engineers sitting there, saying things that were an absolute falsehood—that they could recontour the Equity site and there would be no more acidity coming out of it,” she said. “I thought, ‘I know more than those guys know,’ and it isn’t just about the Equity site. They don’t know anything about oxygen diffusion or convection, or about flow paths through waste rock dumps,” she said. Ferris began to speak up on technical issues at other mines projects. Together with Allan Young and other environmentalists, she founded a group called B.C. Environmental Mining Council. Although she was unpaid, Ferris said she got a lot of help from environment officials and was paid to travel to meetings of the Northwest Mine Development Review Committee. In 1986, she won the B.C. Minister’s Award for Environmental Achievement. By the mid 1990s, Ferris was helping on the site plan for the new Huckleberry Mine and consulting on dozens of other mines, forestry and land-use plans for First Nations. She advised on the security provisions and post-closure plans for the B.C. Mines Act, and contributed to the Canadian Environmental Assessment Act. Health problems have since forced Ferris to slow down her campaign work, but she said there’s also been a shift in how much citizens can take part in the technical side of project reviews. “It was different in the old days,” she said. “Now, there’s a lot more money, it’s much more corporate. People like me are basically ignored. Thirty years after the Equity spill, Ferris and Hap still live on Buck Creek. So do several moose, a grizzly bear, and geese that shelter up by her house when there’s a fire. 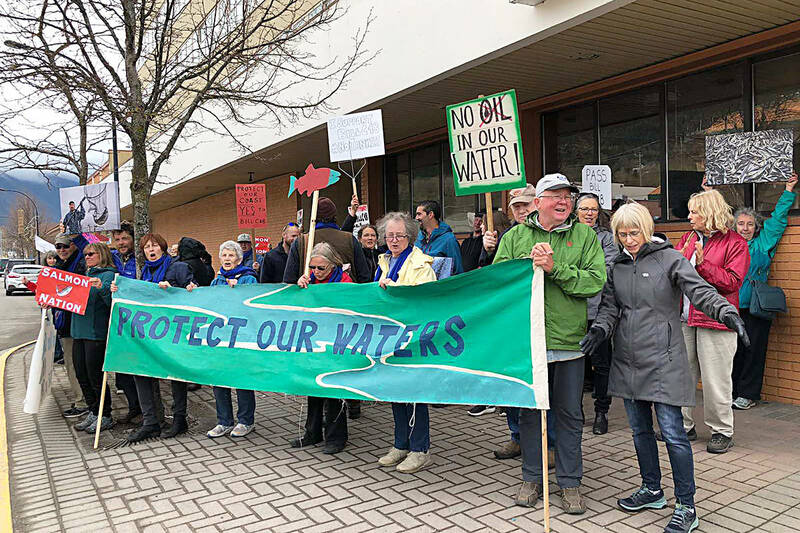 Equity is still in the neighbourhood, and Ferris regularly meets with mines manager Mike Aziz (“A good man,” she says), and other members of the advisory committee to monitor the water there. But today, in 2012, Ferris says more serious changes are coming to her home at the end of the Buck Flats Road. Enbridge is proposing to build twin pipelines that will carry bitumen and oil condensate across the Buck and the Bulkley. Apache Canada is leading the KSL project to build a natural gas line along a similar route. At a recent open house, Ferris challenged Apache officials on their traffic, wildlife and wildfire-protection plans.